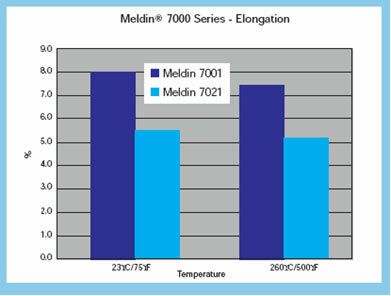 MELDIN® 7000 series of materials exhibit extremely high geometric stability at elevated temperatures. 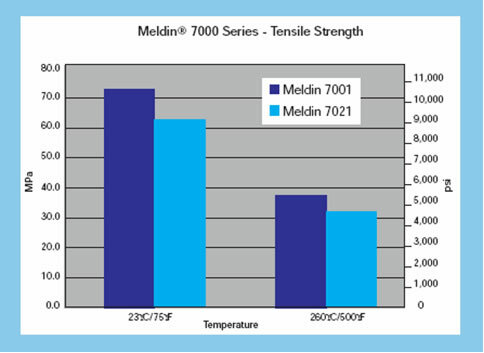 Testing has shown MELDIN® 7000 to have less than 0.04% variation from its original dimensions after cycling from 73°F (22.77°C) to 500°F (260°C) over a 2 day period. The expanding resin production facility and the R&D testing labs allow the producer to maintain control of the quality and source of the base polyimide resin. The "Powder-to-Parts" capability means total process control of resin production, stock shape manufacturing, direct forming, and critical dimensional machining of your finished parts. A thermosetting polyimide, MELDIN® 7001 is our unfilled base resin. This grade offers the maximum mechanical properties and high chemical resistance. The MELDIN® 7001 grade is ideal for electrical and thermal insulating applications. More ductile than ceramics, and lighter weight than metals, MELDIN® 7001 is a popular choice for structural parts in aerospace and other applications where metal replacement is desirable. 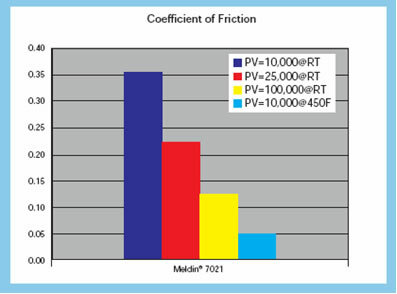 Our self-lubricating grade, MELDIN® 7021, has 15% by weight graphite fillers, encapsulated by the base polyimide resin. With its low coefficient of friction and high heat resistance, MELDIN® 7021 provides our customers the best all around choice for high temperature bearings, seals, and other low-wear applications.